This blog post originally appeared on the Ocean Leaders blog, which highlights the work of Ocean Leaders fellows. Please consider giving them a follow on social media at @oceanleaders on Twitter or OceanLeadersUBC on Facebook! This past weekend, I was on a discussion panel for the documentary film Anote’s Ark, which follows the former present of Kiribati, Anote Tong, in his quest to bring the plight of Kiribati’s people in the face of climate change to the western eye. This sounds harmless enough, but since the film was released a new president was elected, the filmmaker was banned from entering the country, and the Kiribati ambassador to the United States attempted to prevent the film from showing at Sundance Film Festival (this is according to the filmmaker, you can read his take here). It’s important to know that the current president of Kiribati objects to this film not because he doesn’t believe in climate change, but because of the language and messaging the film employs. 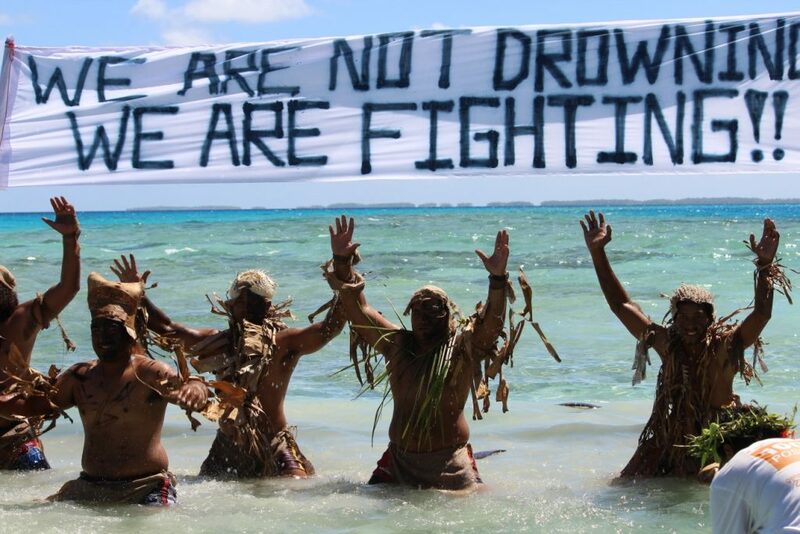 “We are not sinking, we are fighting” is a battle cry heard all throughout the Pacific. The dominant Western narrative about climate change is one in which people who live in the Pacific Islands are helpless in the face of rising sea levels and erosion, and Anote’s Ark uses language that reinforces this narrative. For example, the first thing you see when you visit the film’s website is the question, “What if your country was swallowed by the sea?” While it is true that Pacific Islanders are not responsible for creating climate change, they are far from helpless when it comes to facing its effects, and language such as that used in Anote’s Ark removes their autonomy. Tokelau warriors participate in the Pacific Warrior Day of Action in 2013 (image via 350.org). I was asked to be on the panel because I had just returned from Kiribati, where I spent two weeks scuba diving around Tarawa and Abaiang Atolls with my advisor, Simon Donner, and master’s student Heather Summers, to study the coral reefs for my Ph.D. fieldwork. While we were there, we worked closely with staff from the Kiribati Ministry of Fisheries and Marine Resources Development. I have also worked with communities on other “sinking islands”: in the Marshall Islands (just north of Kiribati) and in the outer islands of Yap in the Federated States of Micronesia. While these places are different in many ways, they are all united by their status as lands on the frontline of climate change. However, none of these communities are ready to give up the fight to save their homelands. Language evoking drowning and disappearing islands gives the impression that their fate has already been determined. Before we left, we had an opportunity to share our research with people from various ministries in the Kiribati government (mainly, the Ministry of the Environment, Lands and Agricultural Development, the Ministry of Fisheries and Marine Resources Development, and the Ministry of Education). These ministries are being proactive and doing lots of great work to slow the effects of climate change. For example, the Ministry of the Environment has planted mangroves in various places in Tarawa’s lagoon to slow erosion, and they appear to be doing well. Healthy coral reefs can play an important role in protecting low-lying atolls like Tarawa and Abaiang from erosion because they break up waves that can cause erosion (in fact, coral reefs dissipate wave energy by an average of 97%). Everyone at the meeting was eager to brainstorm potential ways to protect and restore reefs around the atolls, and we discussed our preliminary findings and their potential implications for over an hour after the presentation. For me, the meeting was a much-needed reminder of how crucial healthy reefs really are to Pacific Island communities; this is easy to overlook from a Western viewpoint, in which people tend to think of their value mostly in terms of tourism and aesthetics. 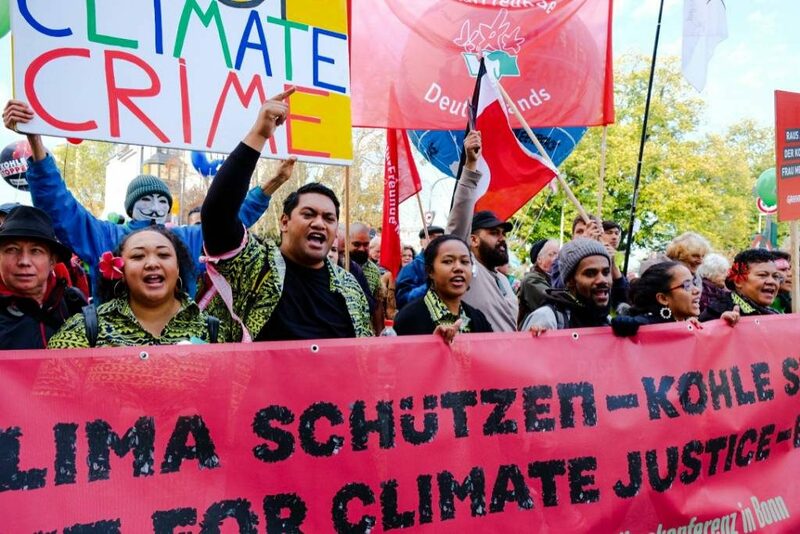 Pacific Climate Warriors lead the People’s March in Bonn, Germany on November 4, 2017 (Image via Hoda Baraka, 350.org). Sounded like the calm ocean breeze blowing through the Baka Tree. The laughter of my Dreu’s* making jokes about the Baigani incident. The mixing of Yaqona at 10am and the call from across the village going mai, mai, mai, dua mada na bilinimua. Yesterday tasted like sui mada by my mother. Fresh fish and Yaqona made by my people. Yesterday looked like the Bula smiles and respectful gaze of my elders. It looked like hope. Yesterday smelt like the voivoi picked to weave the finest mats, like the masi used to wrap my son and daughter the first time they came home. Drue’s – traditional address for people from Vanua Levu, the other bigger island in Fiji. Recently, I was invited to be a part of last weekend’s episode of the CBC radio show, Quirks and Quarks. The episode explored the ways that scientists spent their summers. It was my first recorded interview, and I was thrilled to be asked to participate. I was also extremely nervous. Fortunately both the producer, Mark Crawley, and the host, Bob McDonald, were kind, patient, and easy to talk to. I spoke to Mark first. He emailed me when I was still in Majuro and we agreed we would chat over the phone when I got back to Vancouver. We talked for about half an hour, and then Mark asked me if I would be interested in coming on the show (yes, please). About a week later, I found myself waiting in the lobby at CBC’s office in Vancouver. I was taken to a studio space, where I donned headphones, was instructed how far to sit away from the microphone, and then put in touch with Bob, who’s based out of Victoria. The conversation felt natural from the start, and I quickly forgot to feel nervous about how many people would hear it (according to their website, about 800,000 people listen to the broadcast, and thousands more listen online or in podcast form – yikes!). I’ve heard from a lot of people around Canada and the world who enjoyed learning about my summer, and I’m extremely flattered. I’m also very grateful to have had this opportunity. If you’d like to listen yourself, the interview is available online here. You can also listen to the entire episode here. Bar loe kom (see you later), Marshall Islands! In Marshallese, iokwe means hello, goodbye, and I love you. Translated literally, it means “you are a rainbow.” It’s not a word that’s reserved for family members or even for friends; if you walk down the street in Majuro, strangers who pass you greet you with iokwe. It is, in my opinion, a beautiful way to tell people you appreciate their presence, made even truer because it’s not exclusive — everyone is recognized and appreciated. Rainbows are ubiquitous in the Marshalls. It rained at least briefly most days we were there, and when the sun came out again, it almost always cast a rainbow. We often saw multiple rainbows a day when we were diving, which is a lot, especially considering we spent half of our time underwater. It makes sense that the rainbow would be incorporated into such an important word in the Marshallese language. 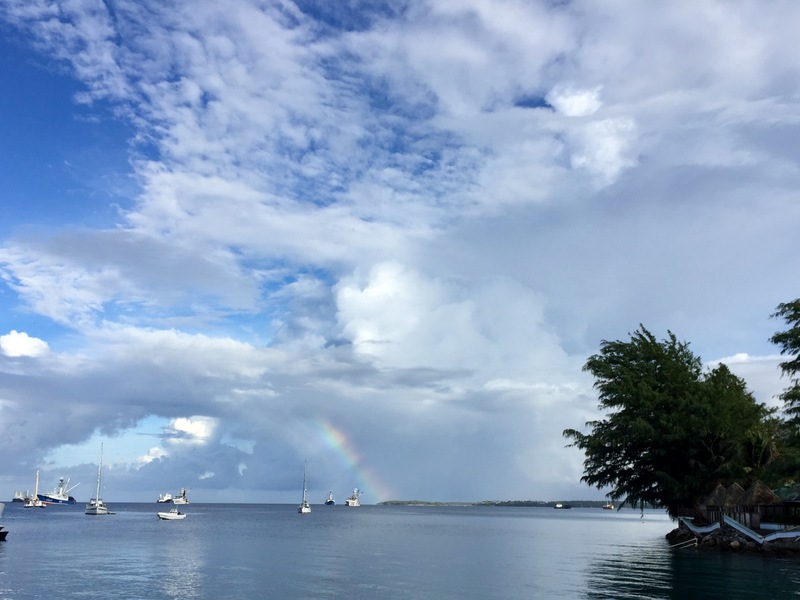 A rainbow over Majuro’s lagoon. It was difficult for me to say goodbye to the Marshall Islands. It’s true that I worked hard while I was there, and I learned way more than I ever could in a classroom. I also had a ton of fun and made some connections that I hope will be a part of my life for the foreseeable future, both personally and professionally. I participated in a fishing tournament and got to reel in a wahoo. 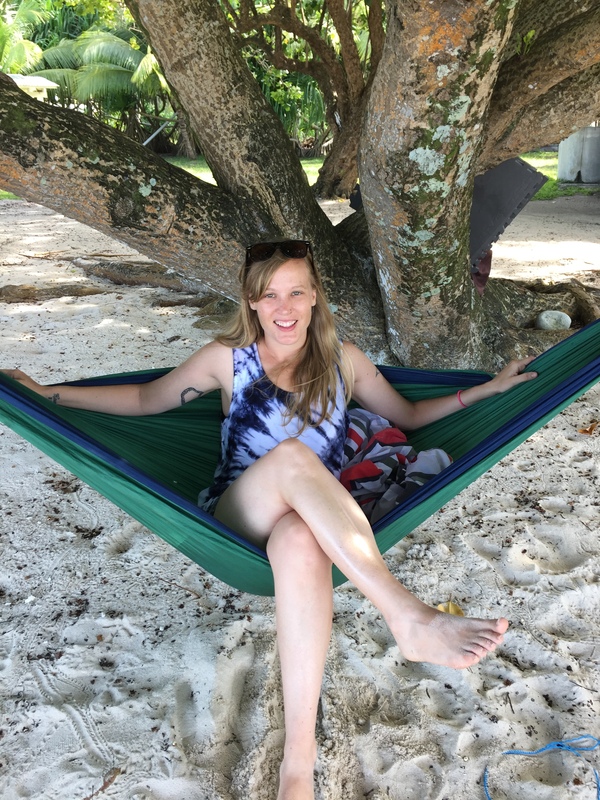 I fulfilled my lifelong dream of sleeping on a hammock on the beach on a remote island, and spent an afternoon picnicking and snorkeling on another remote island. I did a dusk beach dive with some friends and surfaced just as the sun was setting over the lagoon. I’ve seen what seems like a million beautiful sunrises and sunsets, watched the stars come out from the deck of a boat, and counted meteors while laying in the sand on the beach. 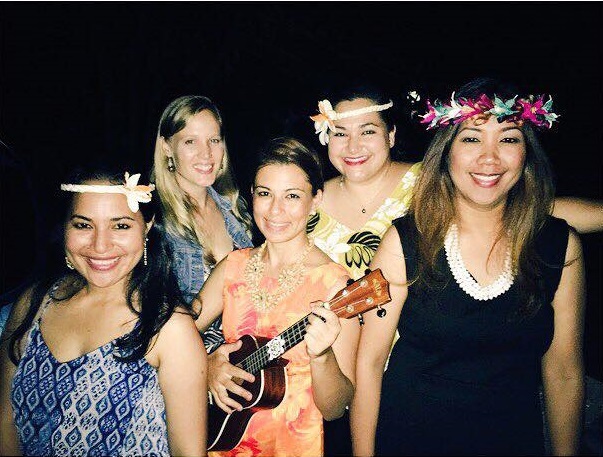 I got to attend a Marshallese wedding and a birthday celebration, and I was warmly welcomed at both, despite barely knowing the people celebrating. I’m sure there were a million other things that I’m forgetting to mention. Going into this trip, I knew the summer was going to be special. I didn’t know that by the time I left, Majuro would feel like home. My hammock on the beach at Eneko Island in Majuro, where we camped for the night. Getting ready to sing happy birthday, Marshallese style. Everyone lines up and sings as they approach the house where the person who’s celebrating lives. Each person greets them in turn and gives them a dollar, and then everyone joins back up in a group to continue singing. I’ve learned that the Marshallese usually don’t say goodbye. Instead, they say see you later (bar loe eok if you’re speaking to one person, or bar loe kom if you’re speaking to a group). Fortunately, in my case, this is actually true, since I’ll be returning to Majuro to continue working there. I’m already counting down the days until summer 2017. So, for now, bar loe kom to all my friends in the Marshalls, and kommol tata for helping me feel at home there. This is the second of a two-part series about my time in Ebon Atoll. The first post can be found here. Ebon Atoll is known for two things: its beauty and its mosquitos (which are gigantic and plentiful). The main island, Ebon Ebon, is long and narrow. In many places, the ocean is separated from the lagoon by a thin strip of land only about a hundred feet wide. It is green and lush, and is one of the most lovely places I’ve had the pleasure of visiting. People in Ebon still eat mostly local food (breadfruit, taro, fish, coconut), and almost everything non-organic is reused. As a result, the island is almost entirely devoid of trash. There are no cars, but there is a main path/road that runs straight down Ebon Ebon, and many people own bikes. It is raked and swept daily, and is landscaped beautifully, shaded by large breadfruit trees and lined with evenly-spaced shrubs. We were there right during breadfruit season, so the ground was often littered with smashed breadfruit, and the smell of it was everywhere. The main street of Ebon Ebon. One of my favorite examples of creative recycling is this whale vertebra (from a whale that beached last year) that was made into a swing. When you think of life on a remote atoll, it’s easy to assume that things are pretty quiet. Life on Ebon seems peaceful, but it’s noisier than you would expect. People live their lives mostly outdoors, so you’re always surrounded by the sounds and smells of daily living: women cooking, fires burning, children laughing or crying, dogs barking, chickens crowing, and so on. At night, the bugs are deafening, and the roosters start crowing around 4 a.m. Frequent rainstorms drum heavily against tin roofs. You can almost always hear the waves. While it’s not quiet, it’s still somehow calming to be surrounded by sounds that are almost entirely organic. Our busy schedule didn’t leave much time for exploration in Ebon, but I was able to take a couple of long walks and bike rides. I also attended church (not a normal habit, but I wanted to be respectful, and this church has an interesting history). Before the arrival of missionaries, Ebon had a reputation for violence (the crew of a trading ship was killed here in the 1851, potentially triggered by the crew’s theft of island women). In 1857, missionaries arrived in Ebon and established the first church in the Marshall Islands. The people in Ebon credit the arrival of the missionaries and the introduction of Christianity for bringing peace to their islands. The only thing breaking the peace on Ebon now is some of the dogs, as I found out the hard way on one of my bike rides (check out the GoPro footage below). If you’d like to see more of beautiful Ebon, you can also check out my friend Benedict’s drone video here. The oldest church in the Marshall Islands, on Ebon Ebon. This is the first of a two-part series about my time in Ebon Atoll. The second part can be accessed here. Last Thursday, I hopped in a terrifyingly tiny airplane and joined staff from the Marshall Islands Marine Resource Authority (MIMRA) on a visit to Ebon, the most southern atoll in the Marshall Islands. We were there for a week of meetings to facilitate the creation of a locally managed atoll-wide management plan, in accordance with the Reimaanlok Process. Ebon is remote, about an hour and a half flight from Majuro. It was a rare opportunity to get to visit, much less to participate and observe the important work these communities are doing. Our airplane on the runway in Ebon Atoll. When we arrived, we were shuttled by boat across the lagoon to the community meeting house, where our meetings were held during the day and we slept each night. In addition to our clothes, we brought food and gifts from Majuro. The boat that ferried us across the lagoon was small, and it sank lower and lower in the water as it was loaded. I was convinced that we wouldn’t be able to fit everyone, but somehow, we made it on board with all of our belongings. The ride to the meeting house, where we stayed, took a long time because the boat was so heavy, but eventually, we made it without losing anything or anyone. The boat ride from the airport was a little bit cramped. We were greeted with food and hospitality, and we were treated as honored guests for the duration of our stay. You would think that eating healthy, preservative and gluten-free local foods three times a day for a week would help to shed a few pounds, but the portion sizes were often so big that I think I ate three times more than I do at home. A typical meal consisted of fish, slices of breadfruit, some sort of taro dish, preserved breadfruit, rice, and sometimes more breadfruit (our visit was right at the beginning of breadfruit season). Often, the women who served us sang and danced as they handed us our plates. A typical meal on Ebon: reef fish, octopus, breadfruit three ways, and taro (not pictured, white rice). The visit was a lot of fun, but we also worked hard. We were in meetings all day every day, with the exception of Sunday (church day) and Tuesday (the first Tuesday of every month is also a church day). There were a number of activities and exercises to complete in order to come up with ideas for the management plan. Now that we’re back, Alicia (our fearless leader) is working on writing everything into a formalized document, which she’ll deliver and review with the participants in early fall. Once it’s been approved, Ebon’s mayer will call a meeting to announce it, and the management plan will officially go into effect. Because I have some experience working with communities on monitoring from my time working in Yap, I was asked to give a presentation on ecological monitoring and do a brief training session. The goal is for MIMRA to be able to step back and have Ebon’s communities eventually take over the monitoring themselves. I gave a presentation on a few different monitoring techniques and what they could tell us about the reefs and their protected areas, and I think it was well-received. I also got to take a small group of people out snorkeling to practice doing some surveys, which was my favorite part. Making friends with sea cucumbers while showing the communities how to do invertebrate surveys. Photo via Selina Leem. When we left, we were showered (almost literally) with gifts of food, coconut oil, and flowers. I brought home eight bottles of coconut oil, two bottles of coconut syrup, a bottle of lime juice, a bottle of coconut vinegar, bananas, salt fish, two coconut crabs, a lobster, and preserved breadfruit – and that’s all I could fit in the box I had (we had to leave more behind). I was overwhelmed by the generosity and kindness we were shown each day, and by the time we left, it felt like I was saying goodbye to people I had known forever. Kommol tata for your hospitality, Ebon! This week, I started my internship with the Marshall Islands Marine Resources Agency (MIMRA), rented a bike for the summer, and generally got settled into a day-to-day routine. Everyone here has been fantastic, and I’ve made some wonderful friends who have gone out of their way to make sure I feel at home, both inside and outside of work. I can already tell that I will miss Majuro when the time comes for me to say (a hopefully temporary) goodbye at the end of the summer. Things are just warming up at my internship, but so far I’ve been working on updating some educational materials that I wrote for communities in Ulithi Atoll so they can be used in the Marshalls, and helping to analyze photo quadrats of benthic surveys using the software CPCe. Next week, I’ll help to prepare a report by analyzing some data that was collected from sites around Majuro and writing a summary of what was found. It sounds like I’ll be joining MIMRA on a couple of outer islands trips in the coming weeks, which I’m thrilled about. The first is to Ebon, the southernmost atoll in the Marshall Islands, made famous by a castaway who arrived there from Mexico after 13 months at sea. We’ll be flying there on Marshall Islands Air, will stay for about a week, and I’ll help train community members in benthic monitoring techniques (using snorkel instead of scuba), again based on the work I did in Ulithi. The second trip is to Ailinglaplap, northwest of Majuro, where I’ll be assisting MIMRA with ciguatera monitoring. There’s been an awful outbreak there and a number of people have died. I don’t know much about ciguatera, but I appreciate the opportunity to participate and learn from the vital work MIMRA is doing (don’t worry, I won’t eat the fish, although that’s easier said than done on an outer island atoll). Ebon Atoll, the southernmost atoll in the Marshall Islands. Image via Google Earth. I’ve really fallen in love with life here. To give you a small glimpse of what that looks like, I strapped my GoPro to my bike (rented from College of the Marshall Islands for an extremely reasonable $2 per week), and made a tour of my commute to MIMRA. Town is much more congested than this – I live a bit on the outskirts – but I love commuting on my bike. The morning (when this video was filmed) is comparatively cool to the heat of the middle of the day (although I’m still a sweaty mess by the time I arrive). In the evenings, when people are awake and the weather has cooled a bit, it’s even more fun – there are basketball and volleyball games, people socializing, the smells of cooking, and just general evidence of contented living. Riding through town is a bit more harrowing, but still nothing compared to the hazards of city biking. I will be absolutely ruined when it comes time to go back to biking the hills of Vancouver, though. On Thursday, we wrapped up our final day of diving in Majuro. Our first day was a bit of a rude awakening compared to the relatively clean reefs of Arno, but we were pleased to discover some beautiful sites on our last three days of diving. My first impressions are pretty much what we hypothesized, that the sites around Arno have more coral diversity and higher coral cover than the sites around Majuro, which are close to higher populations of people. Next comes the fun part: Analyzing the data to see if they show the same thing! Branching Acropora and Acropora tables at a site on Majuro’s oceanside. Look closely and you may be able to see a tiny coral crab (hint: he’s white and blue)! Things went really well until our second-to-last day of diving, when the boat we were on broke down. Fortunately, we were rescued by our captain’s nephew Ben, who then agreed to take us diving on his slightly fancier boat, the Four X, for our last day. It took us over six hours to get towed back to the dock, and we missed our third dive of the day, but the good news is we had a chance to watch the sun set over Majuro, and then could see the stars come out. We missed Ronnie and Cary on our last day, but had a lot of fun with Ben and his first mate. Their boat is a little faster, so we were able to wrap up quickly, and were back at the dock before 4 p.m.
There’s always a silver lining, and in this case it was the chance to see the sun set from the boat. That night, we had a farewell dinner with a few of the many people who have helped to make this project a success. It was a lively affair with lots of animated story telling. I’m excited that I still have another ~7 weeks to spend with the wonderful people we’ve had the pleasure of working with. We’re already starting to plan our trip back to continue working here next summer (fingers crossed). I spent the weekend catching up on emails, laundry, data organization, and getting ready to start my internship with the Marshall Islands Marine Resources Authority (MIMRA) next week. I also spent an inordinate amount of time trying to avoid starting myself or my apartment on fire while cooking dinner on a hot plate for the first time. And, because I’m a firm believer in marking momentous occasions with tattoos, I took a break to visit a friend at his shop, Marshall Arts Tattoo. This way, a little piece of the Marshall Islands will be with me always. Don’t mind the bright pink walls of my apartment. We couldn’t dive on Friday and Saturday (July 1 and 2nd) because of a national holiday in the Marshall Islands, National Fishermen’s Day! We also ended up not diving today (Sunday), because one of our core team members wasn’t feeling well, so we took an extra rest day. I think it’s turned out to be a good thing, since it’s given us a little time to explore Majuro. I mentioned previously that Majuro is much more developed than Arno. Majuro has about 30,000 people living in it, while Arno has less than 2,000 (and Arno is a bigger atoll in terms of area). There are multiple restaurants, a few bars, hotels, and even a couple of nightclubs (we checked one out last night, it was fun!). It used to have a bowling alley and a movie theater, but they’ve both closed. There’s even a large grocery store where you can buy health food staples like tofu and quinoa (I was shocked by this). One thing that’s united every place I’ve visited in Micronesia so far is fervor for fishing, and there’s no place that’s truer than in the Marshall Islands. National Fishermen’s Day is a holiday that’s celebrated in all of the atolls here. There are two different tournaments, the Urok (bottom fishing) tournament and the Billfish tournament. The boats line up at a dock, where the fish are offloaded and weighed in front of an enthusiastic crowd. Every year, two teenage girls are chosen to be Ms. Billfish and Ms. Urok, and they give out leis to each of the participants and pose for photographs with each team and their catch. Then, the team moves off and the whole process starts again with the next boat. We went to the weigh-ins on both Friday and Saturday. Apparently, this year wasn’t a great year because the largest billfish was a ~215 lb. marlin (people have caught ~700 lb. marlins in the past). It was still the largest fish I’ve ever seen, and I can’t even begin to imagine what a 700 lb. fish looks like. I really appreciated that the tournament allows participants a chance to earn extra points by releasing the really large fish they catch. They’re required to show a time-stamped photograph to prove it was caught during the tournament day and to get an estimate of its size. 2016’s Ms. Billfish, with the team that caught this year’s biggest marlin. Also on Saturday, I moved into my apartment! It’s right above a store and a Laundromat on Long Island, which is out closer to the airport. The walls are bright pink, which is kind of blinding, but it’s got air conditioning and the internet (supposedly, it hasn’t been working since I’ve been there), which were my main requirements. To get to the hotel where the rest of the team is staying, I have to take a taxi (they cost $1.25 each way, so no biggie). Here, almost every other car is a taxi. They’re all shared with multiple people, and to catch one you just stand and hold out your fingers to show how many people are with you. The ride takes about 20 minutes, but mostly because there are multiple stops along the way (also, sometimes the taxi driver has to run some errands while he’s en route). I’m hoping I can borrow a bike at some point, which would be a great way to work off the ~90% carb diet I’ve been eating since I got here (white rice is a staple for most meals). Tomorrow, we’ll get back in the water and start exploring the reefs around Majuro. We only have four more days of diving ahead of us – things are moving right along. The rest of the team says their farewells on Friday, and I’ll start my internship with MIMRA the following week. Fortunately, my diving adventures won’t end this week, as I’ll hopefully get to dive with MIMRA at some point, possibly at another of the outer island atolls – fingers crossed! In just under two weeks, I’ll board an airplane and say goodbye to continental North America for two and a half months, the longest I’ve ever spent abroad (well, if you don’t count living in Canada). My advisor and I will be spending a week in Honolulu for a conference, where we’re presenting a poster, “Climate Variability and the Resilience of Low Diversity Coral Communities to Bleaching in the Gilbert Islands, Kiribati”. We’ll meet the rest of our research team there, and then we’ll all fly 2,300 miles to Majuro, the capital of the Republic of the Marshall Islands (RMI). You may have heard of it; the RMI are often in the news these days, as they have been heavily affected by rising sea levels, and the government has recently taken bold steps to fight for global nuclear disarmament. I’ll stay there for the rest of the summer, and will be returning to Vancouver in late August. With just under two weeks until go time, things are a little hectic. I’m working hard to finish processing raw data from Kiribati so that I can analyze them in time to prepare the poster I’m presenting. I just finished writing our Dive Safety Plan, which identifies our emergency contacts and a protocol for evacuation in case of a diving accident, in accordance with the University of British Columbia’s Research Diving Manual. Last week, I ran around and had a million medical tests done to show that I’m healthy enough to work as a commercial diver (I passed, thankfully). I’m making ever-growing lists of all the things I need to pack and loose ends to tie up. And, I’m studying up on Marshallese; most people in Majuro speak English, but in other atolls I won’t be able to communicate without at least a rudimentary understanding of the language. On top of all that, I’m trying to squeeze in as much quality time with my son as possible before leaving. To give you a brief overview of my M.Sc. research, I will try to understand the influence of local human disturbance on coral composition and their resilience to heat stress in Majuro and it’s neighboring atoll, Arno (it’s about 19 miles away). The RMI have been inhabited for thousands of years, but unlike Arno, Majuro underwent extensive human modifications after American occupation during World War II, and it’s now home to half the country’s population. I’ll compare sites across the two atolls to evaluate the role of local disturbance in recovery from a major coral bleaching event that occurred in 2014. My research will contribute to a broader project being overseen by my advisor that is using the central Pacific as a natural laboratory to study the role of past climate experience and human disturbance on the resilience of coral reefs to climate change. The data collected from RMI should provide an important contrast to data from neighboring Kiribati, where the reefs are subject to more frequent heat stress due to the El Nino / Southern Oscillation. Image via earthobservatory.nasa.gov. Arno is visibly much larger than Majuro, but is home to less than 2,000 people and the population is shrinking. The population of Majuro is about 30,000 and it’s still growing. I get to stay for such a long trip thanks to my fellowship with TerreWEB, which has provided me with the fantastic opportunity to do an internship abroad. I’ll be working with my advisor to gather the data for my own research, but after that’s done (around July 9), I’ll stick around to work with the Marshall Islands Marine Resources Authority (MIMRA) until the end of August. I’ll be helping with things like data entry, data management, and data analysis, but will also get to observe and participate in the world-renowned Reimaanlok process, a conservation plan that is hailed as one of the first to emphasize a community-based approach. I may get the opportunity to join MIMRA when they visit Wotje and Mejit Atolls in late July, and could potentially participate in ciguatera monitoring in Ailinglaplap in August. They may even let me take a stab at writing a draft of a community-based management plan after consulting with communities in some of the outer atolls. It’s an incredible, once-in-a-lifetime opportunity, and I’ll gain invaluable experience. I’m going to learn a ton, and I’m beyond excited! Image via Travel.nationalgeographic.com. The RMI is made up of about 70 square miles of land spread out over 750,000 square miles of the Pacific. For reference, the area of Rhode Island (the smallest state) is about 1,545 square miles and the area of Alaska (the largest state) is about 663,267 square miles. My fellowship requires that I document my experiences (which I’d probably do anyway because I don’t want to forget a second of it), so I’ll be doing that here. If you’re interested in staying up to date with my research and subsequent adventures, check back or sign up to receive email alerts when I post (see the right-hand sidebar). I may even try my hand at video blogging, but it depends on if I can get enough of a handle on my various electronics by then!